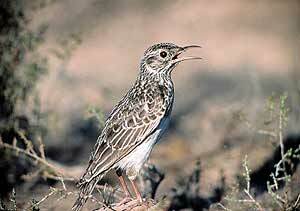 A study has found Dupont’s lark (Chersophilus duponti) is losing its singing range because numbers are falling. Spanish biologists have found that when male larks had fewer birds from which to learn new notes or ranges their repertoire decreased. The number of notes a male uses is vital in attracting females. Dupont’s lark, is only found in Europe in Spain where just 2,000 birds are thought to remain, as their natural habitat has been relentless destroyed by changes in land use, particularly the spread of irrigated dry land so we can all have cheap tomatoes in February, reforestation and above all by the growth of wind farms. The scientists recorded the singing range and number of notes of 330 male birds, mainly in the Ebro valley region in north-east Spain. Using hidden microphones in places the birds usually inhabited, they taped mating calls. Paola Laiolo, who led the research team, said: “The female birds are attracted by the complexity and range of the male’s song. Note: SEO made Dupont’s lark its Bird of the Year for 2006.